As one of the Premier League's top scorers this season, Alexis Sanchez's form is drawing attention from all quarters but as his club begin contract negotiations Arsenal fans are demanding they do whatever it takes to keep the Chilean star at the Emirates stadium - including paying his dogs. Sanchez is a huge dog lover. Massive. I mean, if you look at his Instagram accounts you'll find his two dogs, Atom and Humber straight away. His photos and video tributes with background music from Aerosmith and Bryan Adams show every aspect of their lives together from playing at home or in the park during down time to travelling on private jets. 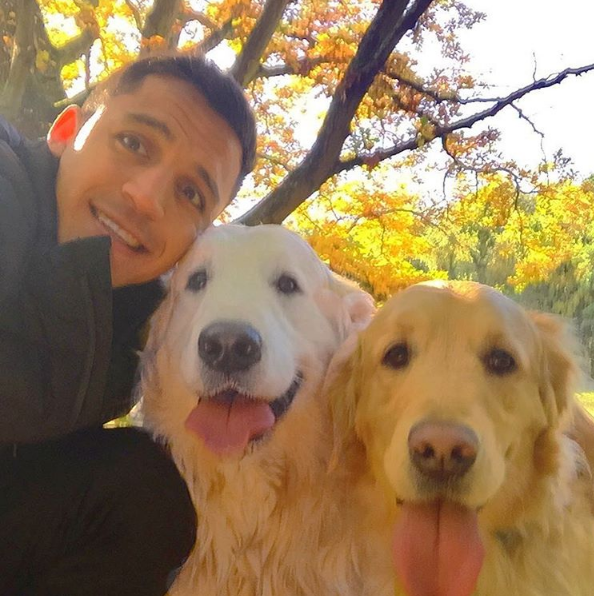 Sanchez's love of sharing his dogs adventures is such that he's even launched an official Instagram account dedicated to his two best friends, which include a TV advert the trio took part in for a Chilean dog food. Adorable, right? Well, this pushes the boundaries even further. Here's the footballer showing his dogs their TV advert on a big screen. Speaking about his dogs, knowing them and them knowing your moods, Sanchez has said: "You can always trust them, they are with you in the good and bad moments." His fans think the stability, enjoyment and influence Atom and Humber have on him is reflected in his performance every game. Indeed, after scoring twice this weekend against Bournemouth AFC he admitted in a rare interview to Sky Sports that he was heading home to celebrate the team's 3-1 victory with his dogs, so are Arsenal fans right? Can dogs really have an influence on our mental wellbeing professionally? In recent years events encouraging employers to allow dogs into the office environment has been boosted by research which shows the therapeutic benefit in a stressful environment from simply having a dog around. A study by the Virginia Commonwealth University even goes as far as saying having a dog around can make the job more satisfying for employees, reduce burnout, fatigue and even sick days. But what about team work, can dogs unite teams? On this point Sanchez has previously said: "There is a beautiful legend that tells us that animals are voluntary souls, without the gift of words, who have come to show man the value of his actions, of solidarity, of acceptance, of freedom and the value of teamwork.... and the more important the love." Perhaps this reveals why his dogs are such a big part of his life and how we can learn from them as individuals and to enhance how we work together as a team.